Balloons have that magic of gravity defiance and that unique ability to elicit and delight the child in us. Balloons In Balloons In . . .
Players put a balloon into the box (right), then spin the spinner to decide how many nails get put into the top of the box. Sooner or later, someone drives the final nail! The object here is to build a house of cards without the opponent blowing it over. 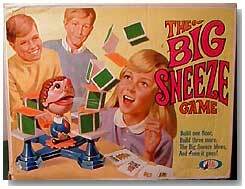 Players pump up the Big Sneezer, who has a balloon in his nose. Eventually the pressure builds, and the Big Sneezer lets go, demolishing the house of cards. 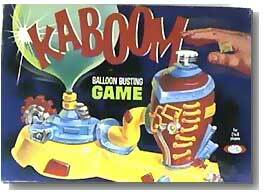 A "balloon busting game". Players load a balloon, and through some device - dice or a spinning card - are assigned their pump number. Eventually, the inevitable happens - the balloon bursts. 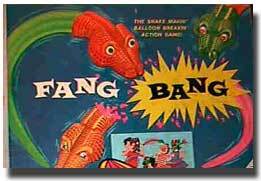 Fang Bang"The Snake Makin' Balloon Breakin' Action Game"
Players wear masks (which are included) and try to break the other players' snakes with their own snake's metal fangs. Players duel with balloon snakes to try and burst an opponent's balloon. A game of balance and skill. The objective of the game is to drop marbles into the top of a hat. The hat sits on a balloon, which eventually breaks from the weight of the marbles. The loser is determined by who rolled the last marble. 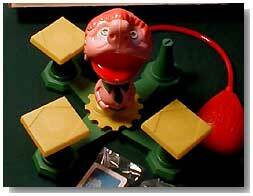 Schaper was the same company that made Cootie. 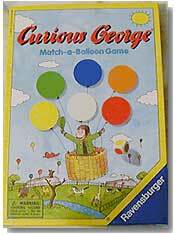 Curious George Match-A-Balloon Game, by Ravensburger. Curious George fans get to know their favorite character a little better with this game. 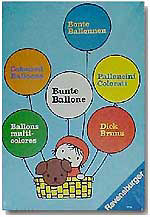 The game features balloon cut-outs while introducing the concepts of color, matching and group play. Each child is given a game board that shows Curious George with balloons in 6 bright colors. Players roll the color die and place the matching discs on their balloons. The first player to cover his or her board wins, or all players can play cooperatively and help each other to fill all the boards. This is a variation on a similar game, also by Ravensburger (shown on the right.) Each child participant works to cover their balloons with matching cut out balloons. 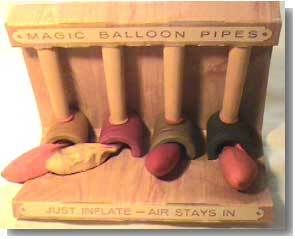 Magic Balloon Pipes, by the Van Dam Rubber Co, Inc. This was a lot of fun for children. Blowing one end of the pipe inflated the balloon at the other. A marble in the bowl of the pipe kept the air from escaping. 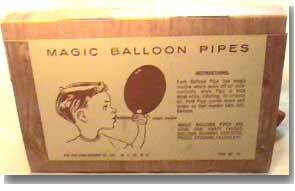 While you could spend many hours playing with these by yourself, balloon pipes could be shared with others, adding life to a party. The pictures show a set of wooden blow pipes made by the Van Dam Rubber Co, Inc.
"Johnny Astro" used a balloon to simulate a lunar module which flew around the room when guided with a fan (disguised as a satellite dish!) You had to keep the fan at an angle to the balloon. The fan had a variable speed control to change the force of air flow. The lander had legs which adhered to the body of the balloon, helping to keep it upright. From Jeff Stein's: "This is a seriously cool toy, boys! Johnny Astro was one of a series of "Johnny" toys made by Topper Toys in the 1960's. As you can see from the picture, it has a futuristic console that allows you to control the action! It is really just a static plastic unit with a joystick to control the fan on the end. The left hand side of the console has a rheostat that controls the speed of the fan. You tape one of the enclosed gondolas to the underside of a balloon to use as a ship. Then, using the fan, you can make the ship take off, maneuver, hover, and land. It is a fun toy." Images & text used with permission of J. Stein; 5/2000. The principle at work is a lightweight vehicle, powered by a balloon with a controlled deflation that serves to 'push' the vehicle across a flat surface. These can be bought used at places like eBay. 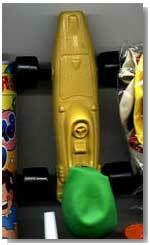 For a new balloon car, the Klutz Press people offer a pair for $10.00. Whheeeeee.......... ***smile*** TheBalloon Racers Set is viewable athttp://www.klutz.com/toys.cfm . Essentially a liquid plastic that you squeezed out of a tube, rolled into a ball, then attached the ball to a plastic straw. Blowing on the straw produced a large balloon, which theoretically could be taken off the straw and 'dried'. A recent brand of balloon plastic in a tube is called "Original Dr. Cohn Blase Ball Balloonpaste." It is made in Germany by R. Viegel Spiel-und Sportwarenfabrik Hauptstrabe 58 D-74376 Gemmrigheim. It is pictured at near right hand side. 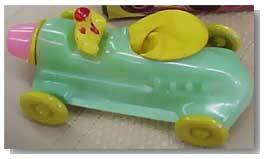 "Super Elastic Bubble Plastic" was a Wham-O product that came in tubes. 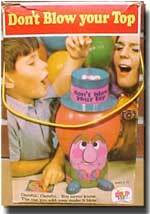 You squirted some out onto your finger, rolled it into a ball, stuck a straw into it and blew until you had a balloon. 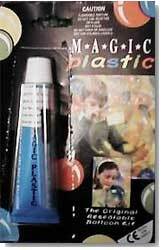 In late 1997 I came across a similar brand of balloon plastic in a tube called "Magic Plastic - the original resealable balloon kit". It is made in England; "an established toy since 1947." Pictured far right hand side. As a child, I played with stuff like this. It smelled bad, and I never got anything like the bubbles shown on the package. At best I got a thick, smelly, bulging mass. Latex balloons worked much better for me. Talkie Tapes are called by many names; Talkies, Talking Ribbons, Talking Strips, Talking Tapes, Talking Device, Talking Balloons. Just stick one end on a balloon, slide your thumbnail down the strip, and it will talk out loud. It's a 24 inch red plastic strip audio recording; similar to the groove on a record, but straightened out. Us old folks that remember vinyl records can see that this is a record in linear form. A 1.5 second long ribbon played with the thumb nail as a needle. Talkie Tapes are played by sliding your thumbnail down the recorded side. They must be attached to something (Greeting cards, Balloons, Advertising Boxes, etc.) to amplify the sound and give it a voice. An inflated object of any shape, size or material will TALK with a Talkie Tape attached (attach using a piece of adhesive tape or a sticker.) They're made of a thin piece of vinyl or plastic, and they have grooves on them just like an album. They are similar in theory to record albums. You hold or attach one end against a balloon or piece of paper, and run your fingernail over the grooves to produce a message. The balloon amplifies the sound. A Santa balloon becomes a TALKING SANTA - an ideal, inexpensive promotion to increase store traffic or for sale. An 18 inch foil balloon with a Talkie Tape is extremely loud. They can be used at balloon shops to add a buck or two to the sale: "Would you like to make that balloon talk?" Always say the message first - never say, "listen to this." By stating the message first, the listener is conditioned to hear the message, and they will understand it every time. Remember the "talking balloons"? They had the plastic ribbon with ridges on it and when you ran your fingernail down the ribbon the balloon made a sound like it was saying words. The Incredible Balloon Machine Company that makes the Balloomers stuffing and the puffPAC mylar wrapping machine offers them. Their number is 1-800-748-6995. I used to attach one of these onto a playing card box and it would say the name of the card. It was hard to hear. I was not impressed with how they worked; it took a lot of imagination to hear anything. The balloon ones were slightly better. I would run my finger down it at normal speed and it would say "Happy Birthday to you." Then I would say, 'Here's the same message with helium', and I would run my nail over the strip REALLY FAST. It always got a laugh. Balloons filled with water instead of air. Usually very thin-walled, round balloons are used. They can be launched by hand, fired with a modified sling-shot, or launched with a catapult-like device. The sling shot is either hand-held (above, left) or a 3 person device (above, middle). Two people hold the band, stretching it taut, while the third person holds the balloon pouch, loads the water balloon, and releases. Theoretically, one person could use the 3 person launcher by holding the bands in each hand, and using their foot to control the launch pouch. Ranges vary for each model. The hand-held sling shot is claimed to reach 75 feet or so, while the three person launcher can fire a water balloon as far as 300 yards. 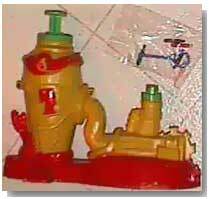 The launchers are generally sold with warnings not to fire water balloons at people or property, as some of these devices fire water balloons at 75 mph. The utility of a launcher, over simply tossing by hand or dropping from a height, is a little questionable. One place they are used is on boats, or at beaches, where there are either no targets, or targets are far enough away that the potential for harm is minimized. Slingking at http://www.slingking.com sells a variety of water balloon launchers and slingshots. The Water Balloon CannonTM sends 3" balloons over 600 feet. They also sell the Water Balloon Launcher, which sends a water balloon a mere 300 feet - and still no good for close up work in the next water war. At the Blowguns Northwest site http://www.blowgunsnw.com, they sell the Blaster and Launcher, with online video clips showing the equipment in action!. At the site, visitors can choose from several video clips, with launches of water balloons and T-shirts. The launchers are used to fire T-shirts into crowds as a promotional idea. 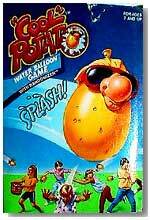 This is a water balloon game that comes with 12 balloons and a plastic face that fits over the top of the balloon. 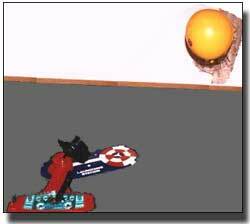 In the nose, there is a "Randomizer" which is a small ball that at unknown times pinches the balloon and breaks it. While waiting for that to happen, contestants throw the ticking time bomb water balloon around to one another. The game came with many assorted faces to choose from. The face on the cover is "Murf the Surf". "Wham-O Super-balloons" are out of production. It was a tube of thin plastic, about 1 foot wide and 8 feet long that could be closed at the ends and thrown around. I don't know if it is the same thing or not but Group Publishing, Box 485, Loveland, CO 80539 sells what they call Tube-a-Loon. It's as you describe but only 6" wide and about 6 feet long. KIPP Brothers, Inc has a similar product, called 8 Foot Flying Rocket. Stock No. NC8773. Their telephone number is 800-428-1153. 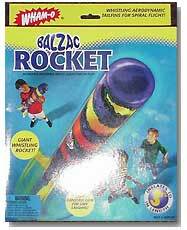 The Balzac Balloon Ball is a toy that comes with a large balloon (there is a small version available too, and I think they come with more than one balloon so you will have a "refill") that you put into a material cover that has a slit in it big enough to fit the uninflated balloon into and allow you to inflate the balloon by leaving the nozzle out of the material cover while blowing it up. Once the balloon is blown up enough to cause the material to fit snuggly around it you tie the balloon off and stuff the nozzle inside. It is a very cool toy. The material really helps to keep the balloon from popping and when it does the pieces don't go everywhere as they are caught inside the material. The material is a very lightweight material (and the designs are very cool too) so you still get the effect of throwing a balloon around but with extra durability and safety. It comes with the directions of doing things like adding rice, or water, or a coin or two to change the effects of what the ball will do. I have seen them at Toys R Us stores many times and my four children have enjoyed playing with them immensely, as have I. Definitely a great thing to bring along for party games too. 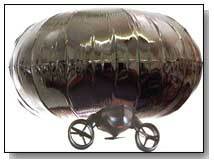 The idea is similar to the Balzac Balloon ball. The Balloon Ball is a cloth cover put over a balloon. Now the balloon can be bounced, kicked, hit, whatever with less chance of the balloon popping. You can learn more about the Balloon Ball at the manufacturer's site, which they say will soon have photos. 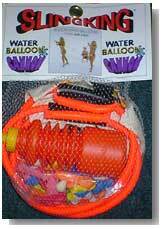 The cover fits ballons up to 16", and provides a fun, easy way to keep kids entertained for hours. The company is located in Canada. Yo-yo balloons are thick-walled, small, round balloons that are filled 1/2 and 1/2 with water and air. They inflate to approximately 3" in size. A long elastic with a loop on one end for a finger is attached to the neck of the tied, inflated balloon. When thrown down, the water in the balloon pulls down while the elastic brings it back up, insuring this "yo-yo" to ALWAYS return! The balloons come in a range of colors (or with no color, as a clear), with color lines as decoration. You can get them from All American Balloon Supply (800) 927-9778. The price is $75.00 for 500, or $20.00 for 100. There is also a 4-color cardboard display unit that you can buy from All American - it's nice. The piston pump is $4.50 - and definitely worth it if you are making a lot. There is also a clip that you use to seal them, rather than tying them off. The clip tool is $2.50, and the clips are $3.00 per 100. The clips are invaluable - don't try to make more than 10 without the clips. T.Myers, a seller of nearly everything balloon related, also sells the balloons, pumps, clips, and clip tools. Recently, the Yo-Yo Balloons, Etc website opened at http://www.yoyoballoons.com, selling yo-yo balloons and more. They have a yo-yo balloon I haven't seen anywhere else - the Alien Yo-Yo. It is a yo-yo balloon with an alien head line art image. They also offer the Smiley yo-yo balloon. I saw a service organization selling them for $1 a piece as fast as they could make them. I have been doing the yo-yos for a couple of years, and they sell great at $1.00. I have also put the 2' glow sticks into them, and tried to get $2.00. Sometimes they sell great, other times - not so well. The additional problem with the glow sticks yo-yo is that you can't make them more than about an hour in advance. You can make these up weeks in advance and store them in a cool place. The key to selling them seems to be to play with them as you're standing there. 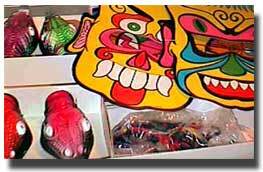 Get some into the hands of the carnival organizers, and let people see them being played with. They'll come rushing to find you. Also, they can be imprinted, which would make nice goody bag stuffers for party entertainers. Or, you could get them imprinted with the name of a store or mall, and use them as an add-on sale to your Grand Opening clients. Whenever we sell them, we fill a great big tub with them, and set it on a low table, so the kids can pick out their color. We also fill some with more water for little kids (it bounces easier with less effort on their part), and some with less for bigger kids (less chance of the elastic breaking when they throw it around). I've sold lots of these and have dropped them on gravel, thrown them as hard as I could against walls (at a seminar I was teaching to demonstrate their durability), had my kids sit and step on them, etc. and they don't pop! I just love these things!!! I've had more adults buy them than kids and most people say they've never seen them before (making them that much more popular). Tying them in knots is almost impossible! I use the elastic "tying" method. To be perfectly honest, the first couple of dozen, I got pretty wet! I worked on a method that works well for me, though, that involves looping the elastic through itself so the more you throw the yo-yo balloon down, the tighter the elastic is bound around the neck of the balloon. For those who may be interested, here's the method I use for tying my yo-yo balloons. This has been tested by young and old alike but, most importantly, by my 4, 5 and 10 year olds!!! Works great for me. After inflating the balloon, you take the end of the elastic and make a loop (a la "bunny ear" style when tying shoes) that is about and inch and a half long. Press that loop against the neck of the yo-yo balloon, loop sticking out near the neck. Start winding the long end of the elastic around the neck of the balloon, while holding the loop firmly in place, going OVER the base part of the loop (the open part of the loop is left exposed). I wind it about 10 times pretty tightly (you can see the elastic stretching). Then take the free end of the elastic (the part you've been holding onto to wind around the neck of the balloon) and pull it through the loop. Tug on it to tighten the loop securely. Now, the more you throw the yo-yo balloon, the tighter the loop remains! Glow sticks that are about 1.5" are also sold by Suzuki Latex and can be inserted into the yo-yo balloon prior to inflating. I make a bunch of these in advance (NOT snapping the glow stick yet). When it becomes dark at the location I'm working, I grab through the yo-yo balloons and snap the sticks (never had one pop). That way you get the longest life out of the glow sticks for your customers. A flat, round balloon with a nozzle coming off the edge at an angle. It spins and whistles as it deflates. T. Myers sells them. They are manufactured by Suzuki Latex. It looks like the minimum order is a box of 74, though this is not certain. 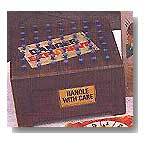 T. Myers makes them available in smaller quantities. Offered by Suzuki Latex. It looks like the minimum order is a box of 24. T.Myers sells these, and says "Flies great. Really, this thing goes up and up and up." Easy to use, well-built, and fun inside or outside. If using it outside, watch for winds that will take this and drop it on your roof. Offered by Suzuki Latex. It looks like the minimum amount is a box of 74. T. Myers sells these in smaller quantities. The twister blows this up with a straw (included), then lets it go. It squeals and squeaks and screams as it flies. One end has a small weight to help the rocket fly level. The rocket balloon is reusable. A punch balloon is a thick walled latex balloon with a rubber band attached. Push your hand through the rubber band and bounce the balloon back and forth. Some people put in a teaspoon of sugar or rice inside, and then blow up the balloon. Makes a great noise and the kids love it! Incredible Balloon (1-800-347-3623 PST) sells a version, called the Peacock Balloon. They are made by Suzuki Latex, which also sells them. The Peacock Balloon is "a magnificent globe of colorful swirls injected directly into the latex." The picture shows a balloon with a surface similar to the inside covers of old books, where the paper was decorated with a pattern of ink carefully swirled on water or some other fluid. Looking for a radio controlled flying saucer or blimp? Plantraco http://www.rcsaucer.com has just what you need. They write "The dream of a radio controlled flying machine that can be flown indoors has been realized." The realization is in the form of the Tri-Turbofan and Twin-Turbofan Saucers and Blimps, which can be flown from the comfort of your own chair. Re-live the Hindenburg in the living room! From their descriptions, it sounds like a fun way to spend some hours flying in the house. Most people just want a twister at a party, but I arrange party games for those who want something more than that. I arrange games to play with the children, depending on their developmental age groups. You can find textbooks for teachers that specifically tell you how to teach certain games to certain age groups, so you'll know whether to use Hot Potato, or Steal the Crowns, or Midnight (my favorite and the favorite of most kids). A 3 fold dog with a large loop for arms will climb a 260 (straight or with a flower or tree top) by moving the straight 260 in a circle and letting the dog swing around it. This works with just a 260 tied in a circle and a straight balloon. Passing the circle from one kid to another can be a formal game or rowdy play. Balancing a straight 260 on their finger. Dump a big pile of balloons on the floor and see what they do, or instruct them to make one big twisted balloon together. Then let everyone break it, or leave it for the mother to enjoy. Pass a balloon under their chin or other parts of the anatomy! Use of hands is not allowed. Balloon dog races - a relay race of two person teams who will race back and forth from table to table creating balloon dogs. Relays: Use the cheap round water bomb balloons. Line 'em up in two rows. Kids have to run to the other side of the room (yard), inflate a balloon, sit on it and pop it, then run back. Put balloons on a bulletin board and have them throw darts for prizes (lots of supervision, small prizes from Affordable Treasures in Los Gatos - great store, like an Oriental Trading company without waiting for the mail). Since you're not in the carnival business, don't make it *too* hard for them to hit the balloons, and be sure to fill them tight so they're easier to break. Have some consolation prizes available, and maybe some cooler prizes for kids that break three. Have a water-balloon toss (definitely clear it with the parents in advance and be sure it's an outdoor party), similar to an egg toss. Have kids break into teams of two and have them throw a water balloon to their partner. Those that survive take a step back and throw again. The team that throws it the farthest without breaking is the winner. At a birthday party, tie some twisted birds to helium balloons and have the kids blow them around an obstacle course or across the room in a relay race. I let each kid start 10 seconds after the previous kid, so there wasn't much standing around. The whole thing pretty much broke down into giggles, and everybody got a prize. The Over/Under game is the game where you line all the kids up, give them an object, and the first person takes the ball and passes it under their legs to the next person, who passes it over their head to the next, and that person passes it thru their legs, and so on, till the last person gets the object, runs to the front, and the action continues. Some kids really enjoy this game, and other times, it simply bombs. Anyway, it is a lot of fun with big, long, awkward balloons - especially 350's. The rule is they've got to hold the balloon with two hands, one on each end, as they pass it back - and believe me, it makes things rather difficult. This has 'laugh riot' potential: works great as a relay type race, but 20 kids at the same time would be pretty entertaining, too. Make a couple of parrots-in-a-swing with longer-than-usual tails. 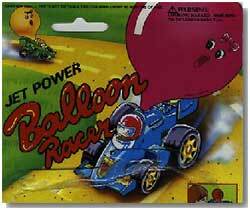 Racers must balance the balloon on their noses while racing. If the balloon falls off, the racer must stop until the balloon is balanced on their nose again. No hands! Great laughs, and it's challenging because the faster you go the more difficult it is to keep that balloon birdie on your snoot. Do the "see who can shoot the balloon the furthest" game. Take one of the latex 18" balloons and put several 1/2" balls inside. Attach a uninflated balloon to the knot. That's it. Use the uninflated balloon to bounce it or whirl the balls around inside demonstrating centrifugal force and several other scientific phenomena. Try to single one ball out of the bunch to whirl. I have found this to be an hours of fun toy for the adult programmers at work. Connect-A-Hats! Connect all the kids into one. The simplest form of connect-a-hat is just a basic loop around the head with the tail sticking up. Connect another 260 to each tail and connect all balloons at the other end (high above the group). Get them to do some sort of relay race where one rule is that they must all remain connected. Great fun! Connect-a-hats These can be as simple as a basic feather hat (loop around head, tail sticking up) for everyone. Use another balloon to extend the "feather" part. Connect as many loose ends as you can into one big pod. The entertaining part is that all those folks are connected, not that the hat is so fancy. Goes real quick and is still novel to most people. Groups of friends and couples really like this. It certainly gets a lot of color and motion in the air in a hurry. Tossing straight balloons so they return. I've seen this done by Bobby Cordell as he twisted figures. Lots of motion and color. Or see how many you can toss up and keep in the air? Shooting them at 45 degrees. If there is not much breeze they can go a long way and come back to you pretty often if they are straight. How many can you keep in the air? For younger kids, about 5 years and younger, attach some round balloons to an outdoor fence and have the children race to see who can break theirs first with a magnifying glass. For kids a little older, a classic balloon game is to provide kids with a large number of small round balloons (already inflated), and some adult-sized clothing. Players see which team can stuff the most balloons into the oversized clothing being worn by one team member within a certain amount of time. For any age group, a balloon-blowing race (racing balloons across the floor by blowing on them) can work well too. And, of course, any game can be made to have an extra-special balloon creation for a surprise. Include instructions for party games on the back of your promotional literature. This makes the literature (along with your name and phone number) something your clients will want to hold on to and refer to for future parties. Shooting the balloon off their finger is big fun and you can make targets and games. Get several pair of 3XX or larger sweat pants. Have someone put the sweats on. You will also have a "stuffer" that will get the blown up balloons and stuff them in the sweats. Have 2 or more teams. Throw the gross or more balloons out in the group. At the sound of the whistle, people pick up the balloons off the floor and start blowing them up. Then, they have to bat the balloons forward and the "stuffer" collects them and stuffs them in the sweats. After about 2 minutes, blow the whistle again, and the "stuffeee" has to pop all the balloons that are in his/her sweats. Throwing himself on the ground or up against the wall or just popping them with hands. Whoever has all theirs popped first wins!! This is fantastic, fun for any age group. We learned it at a Youth Specialties conference to use with Teens, but as adults, we had a great time playing too. Here's a balloon stunt that I do as a time filler. Essentially I spread balloons all around the stage area. Get a volunteer up on stage and put snow shoes on him ( the snow shoes are badminton racquets with straps on them.) I then walk to the other side of the stage and ask the spectator to walk to me without popping any of the balloons. After the kid is blindfolded, unbeknownst to him, all of the balloons are taken away. It is a very funny sight watching the kid walk as if he is on the moon when there is nothing to pop! I yell, " Move right!" and "Watch your right foot!" etc. The audience gets involved yelling. It takes up 7 minutes and is a lot of fun for all. I remembered a thing in Deweys books about shooting balloons. Everyone had their balloons, and I was afraid kids were going to start popping them before I hit the door. So I thought. . . well give 'em something to destroy so the other ones last. I began blowing up all different color 260's fully and then shooting them with my pointer finger at the kids and parents. Before I knew it, every one was shooting them across the room! I made a big circle with another one and told them it was the target . I fashioned a base and voila they were shooting and laughing every where. I incorporate the animals into games. Balloon relays are a good example. I've also used bats attached to helium balloons (prepared in advance) and had the kids bat (outdoors) or blow (indoors) them around an obstacle course. Use twisted figures as prizes for games. Just be sure that every kid wins something or other, and give out consolation prizes to the unlucky few for "creativity in motion" or "most improved" or "funniest flop." My favorite is something my friend Chuck Amos calls a Seattle Flying Slug. He makes it out of one balloon. I like to use two and call it a Giant Seattle Flying Slug. Two full inflated 260s spiral twisted around each other. When thrown like a spear, this spins. Put a little superball inside a 340 inflate it and watch the balloon hop around the room. I use a 350 and a one inch ball. This has always worked fine for me. As I pinch the nozzle, I let the ball roll down to block the air, then let it drop! The problem I encounter is that after a couple of successful inflations and bouncings around the room the balloon becomes limp and wet, and it inflates ok, but instead of bouncing it just bounces once and thwerptssssssss around the room. Let them take turns adding balloons to a hat you are wearing. If you use these ideas, or some others of your own, organize them into party "packages" with set prices for groups of "up to 20," "up to 50," etc., and put them together in a flyer you can pass out or send to parents when they inquire about your services. This will give the parents the secure feeling that you've thought about what you're doing, and you're not just some hack. I have the kids guess what I am making out of balloons. It might take 2 or 3 year olds a while to guess, but that's okay. All the guesses can give you ideas for new sculptures. Whoever guesses it, wins it. If they win one, then they can help other kids guess. One way I have handled crowd control is to have other things available for the children to do such as coloring, bean bag toss, ring toss, etc. while they are waiting. Another way is to have them sit down, and you could do a word game as you twist for the person waiting. Something as easy as I spy the color xyz, keeps them sitting yet involved while they are waiting and watching you twist. A kind word goes a long way. Parents want balloons. It's a fact of life around here. I tell the parents to serve the food, or even open presents while I do the balloons or face painting. That way not all the kids are standing around doing nothing. I have even distributed rocket balloons, or flying saucer balloons to the kids so they have something to play with while waiting. Games sound good, but they don't go over well for me, while twisting balloons. Provide balloon-related coloring pages, pass out crayons, then have the kids tape them on a large poster to "pay" for their balloons (this can create a huge greeting card for the birthday kid). These kinds of activities have a self- regulating factor as different kids will finish at different times, some rushing to get their balloon while others linger and try to impress everyone with their coloring ability. The slower ones will see the line getting longer, and will use that time to finish their pictures instead of standing in line. Try balloon related crafts, like drawing faces on rounds and pulling the nozzle through posterboard "feet." This is something the kids can do themselves while you're twisting their figures. While I was getting ready for one of my many picnics on Sunday, I spotted a large bottle of bubble mix in my clown closet. I grabbed it along with some bubble wands, a large aluminium cake pan and a couple of bubble paddles that I bought at big lots. I also took 4 hula hoops. When we got to the picnic spot (next to a shelter and under a big old tree), I had my face painters use one end of a picnic table, and I used the other end and set up my balloon box, battery pump and all my other stuff. I played music and put out the bubbles and hula hoops and proceeded to have one of the most fun times I have ever had at a picnic! I had a fairly long line, but while they were waiting they played with the bubbles (both the kids and the parents!) and tried the hula hoops (one Dad tried for 10 minutes - said he used to be a champ!) The kids were singing to the music, and I never had ONE single complaint about waiting for a balloon. The two hours flew by, and I left with a nice check and a great feeling! Believe me, it makes things rather difficult. While I was getting ready for one of my many picnics on Sunday, I spotted a large bottle of bubble mix in my clown closet. I grabbed it along with some bubble wands, a large aluminium cake pan and a couple of bubble paddles that I bought at big lots. I also took 4 hula hoops. When we got to the picnic spot (next to a shelter and under a big old tree), I had my face painters use one end of a picnic table, and I used the other end and set up my balloon box, battery pump and all my other stuff. I played music and put out the bubbles and hula hoops and proceeded to have one of the most fun times I have ever had at a picnic! I had a fairly long line, but while they were waiting they played with the bubbles (both the kids and the parents!) and tried the hula hoops (one Dad tried for 10 minutes - said he used to be a champ!) The kids were singing to the music, and I never had ONE single complaint about waiting for a balloon. The two hours flew by, and I left with a nice check and a great feeling! Believe me, I will take the extra stuff with me again - it was worth the trouble. If you buy the Unbelievable Bubble Book from Klutz Press, not only will you have the Bubble Thing (a device to make incredibly big bubbles - we're talking 6 foot long and longer) but you will also get a history of soap bubbles. This includes a brief biography of a person who made bubbles that lasted for weeks in the freezer, as well as bubble sculptors. Maybe a bubble/balloon sculpture is possible. Here is a recipe for home made bubbles. In the long run I think it is cheaper than buying bubbles if you use a lot of them. To make tougher bubbles add one tablespoon of glycerine (available at your local drugstore). Mix and store. The longer the mixture sits, the better the bubbles. You can make a hoop out of a 260 and have a contest of blowing these bubbles through the hoop. If games with the balloons entail popping the balloons, therefore leaving broken pieces on the ground, make sure you have the people place broken pieces in a garbage receptacle. What to do with all the broken discarded pieces of balloon? I had a competition! The persons who bought me the most broken bits of balloon would get a special balloon sculpture. The children took less than two minutes to bring me all the pieces of balloon, and all the bits of balloon were safely placed in my bin. Looking for a distinctively different special balloon for the guest of honor at a party? Have you made a 'Marvelous Miniature' that you want to showcase, at least for as long as the balloon lasts? Then consider using a balloon stuffing machine. 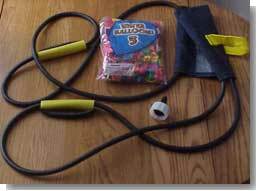 An economical balloon stuffing machine was the Faballoon Balloon Maker. Balloon stuffing machines create a vacuum around the balloon, expanding it enough to put small stuffed animals or balloon animals inside. While balloon stuffing machines cost hundreds of dollars, the Faballoon Balloon Maker sold for $29.99 because the vacuum was created and maintained with a hand pump. Faballoon is not the only choice for a low cost machine, though, so while Faballoon is discontinued, looking will probably turn up another brand for about the same price. Some time ago, I acquired a toy vacuum stuffing machine. It has a hand pump and you need to re-pump all the time in order to keep the vacuum holding. It only holds 9 or 12 inch rounds. It's like the machines gift shops use. Toy or not, it allows me to stuff inflated balloons and balloon figures inside a round. There is only about a 9 or 10 cm opening, but it is more than enough for my use. I used to have a small stuffing machine that I bought at Toys R Us. It came with a few crummy balloons and it was only good for about a 9-10 inch round (of their making because it had an extra wide lip entrance on the balloon) so I bought a bage of Qualatex 16" rounds and I would fill them with animals and curly-Q's and just plain straight 100% inflated 260s, 160s, and 130s. Then I would let the 16" round deflate, take the filled balloon out of the machine and re-inflate with helium. It looked soooooo kewl! So those inexpensive little machines can be used to get some good effects. 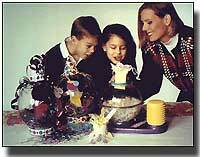 Learn more about balloon stuffing machines at BHQ.